Members of U.S. Congress called on Hungarian Prime Minister to stand up against anti-Semitic remarks of far-right political party Jobbik. 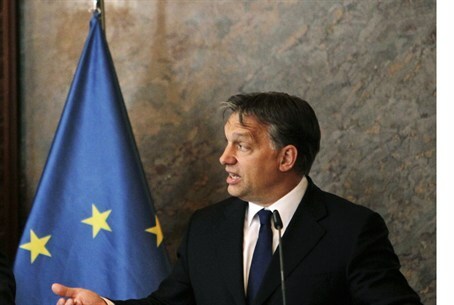 Fifty members of the United States Congress called on Hungarian Prime Minister Viktor Orban to stand up against the anti-Semitic and "homophobic" remarks and positions of far-right political party Jobbik, Bloomberg News reported. “We’re deeply concerned by anti-Semitic and homophobic positions espoused by members of the Jobbik party,” the lawmakers said in a letter addressed to Orban and posted on the website of the U.S. House of Representatives. Jobbik is Hungary’s second-largest opposition party after winning 47 seats in Hungary’s 386-member Parliament in the 2010 general elections. Nobel Peace Prize laureate Elie Wiesel returned a Hungarian state award earlier this month after officials paid tribute to Jozsef Nyiro, an anti-Semitic writer who was a member of the Nazi-allied Arrow Cross regime during World War II. Laszlo Kover, Hungary’s speaker of parliament and other government officials attended a memorial ceremony on March 27 to honor writer Jozsef Nyiro in the ethnic Hungarian part of Romania, where Wiesel was born. Jobbik’s positions “must not be allowed to go unchallenged, particularly in light of reports by the U.S Department of State and the Anti-Defamation League that anti-Semitic rhetoric is increasing in Hungary,” according to the letter. Knesset Speaker Reuven Rivlin told Kover on Sunday that he is not welcome in Israel saying that the government of Israel is “shocked” that he chose to participate in the event commemorating Nyiro. Rivlin said: "A person who took part in such a ceremony cannot participate in an event honoring a man like Raoul Wallenberg, a Righteous Gentile, a symbol of humanity, who saved Jews while risking his life, and who serves as an example of the fight against the Nazis and their collaborators, with whom you chose to identify." Kover was scheduled to take part in a ceremony in Israel in mid-July marking the 100th birthday of Raoul Wallenberg.